found evidence indicating that a diet supplemented with blueberries may protect the brain against ischemic brain damage due to stroke, and against a number of neurodegenerative processes in the brain such as those associated with Alzheimer's disease. For more information about the health benefits of blueberries, blueberry varieties, and how to shop for blueberries visit montefin's FoodFact Glossary. Access all montefin's recipes and food articles atRecipe Master Index Page. Access all pages on www.montefin.com atmontefin's Master Site Index Page. Click to , Tell a friend about this article. found evidence indicating that a diet supplemented with blueberries may protect the brain by reducing the extent of ischemic brain damage due to stroke, and protect it against a number of neurodegenerative processes in the brain such as those associated with Alzheimer's Disease. Available as Fresh Blueberries, Frozen Blueberries, Dried Blueberrys, Blueberry Powder or as a Dietary Supplement in Blueberry Extract, Blueberry Capules, and Blueberry Pills. Yet another study The Change of Total Anthocyanins in Blueberries and Their Antioxidant Effect After Drying and Freezing , found that the antioxidant activity of anthocyanin extracts from blueberries showed there was no significant difference between fresh, dried, and frozen blueberries. Anthocyanins are the bioactive chemical compounds that cause the characteristic colors found in such fruits as blueberries, red cabbage, red grapes, purple sweet potatoes, et. al. At the recent American Chemical Society meeting it was reported that a compound found in blueberries called pterostilbene has "the potential to be developed into a nutraceutical for lowering cholesterol, particularly for those who do not respond well to conventional drugs." Study authors from the USDA's Agricultural Research Service (ARS) indicate that the compound found in Vaccinium berries (blueberries) could be a "potent weapon in the battle against obesity and heart disease through its cholesterol-reducing potential." Head researcher, Agnes M. Rimando and her associates "earlier showed that this compound may help fight cancer." An abstract of the study is found on the Agricultural Research Service website which also studied the presence of resveratrol and piceatannol. According to the technical abstract, "These naturally occurring stilbenes, known to be strong antioxidants and to have cancer chemopreventive activity, will add to purported health benefits derived from consumption of these small fruits." Potential mechanisms of cancer chemoprevention by anthocyanins -- Anthocyanins are the chemical components that give the intense color to many fruits and vegetables, such as blueberries, red cabbages and purple sweet potatoes. Epidemiological investigations have indicated that the moderate consumption of anthocyanin products such as red wine or bilberry extract is associated with a lower risk of cardiovascular disease and improvement of visual functions. Absorption of anthocyanins from blueberries and serum antioxidant status in human subjects -- These results show that anthocyanins can be absorbed in their intact glycosylated and possibly acylated forms in human subjects and that consumption of blueberries, a food source with high in vitro antioxidant properties, is associated with a diet-induced increase in ex vivo serum antioxidant status. Antioxidant Capacity, Vitamin C, Phenolics, and Anthocyanins after Fresh Storage of Small Fruits -- Fresh strawberries (Fragaria x ananassa Duch. ), raspberries (Rubus idaeus Michx. ), highbush blueberries (Vaccinium corymbosum L.), and lowbush blueberries (Vaccinium angustifolium Aiton) were stored at 0, 10, 20, and 30 degrees C for up to 8 days to determine the effects of storage temperature on whole fruit antioxidant capacity (as measured by the oxygen radical absorbing capacity assay, Cao et al., Clin. Chem. 1995, 41, 1738-1744) and total phenolic, anthocyanin, and ascorbate content. Blueberry supplementation enhances signaling and prevents behavioral deficits in an Alzheimer disease model. -- It appeared that the protective mechanisms are derived from BB-induced enhancement of memory-associated neuronal signaling (e.g. extracellular signal-regulated kinase) and alterations in neutral sphingomyelin-specific phospholipase C activity. Thus, our data indicate for the first time that it may be possible to overcome genetic predispositions to Alzheimer disease through diet. 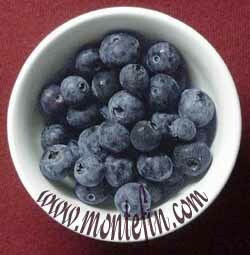 montefin.com is an information, education, and meal preparation resource. Always consult a physician for specific applicability of any dietary regimen or information to your health, medical conditions, and therapies. Also, for a great selection of general recipes do visit Top 100 Recipe Sites . montefin, Tip O' The Ice Cube and Most Wonderful are trademarks of montefin Enterprises.